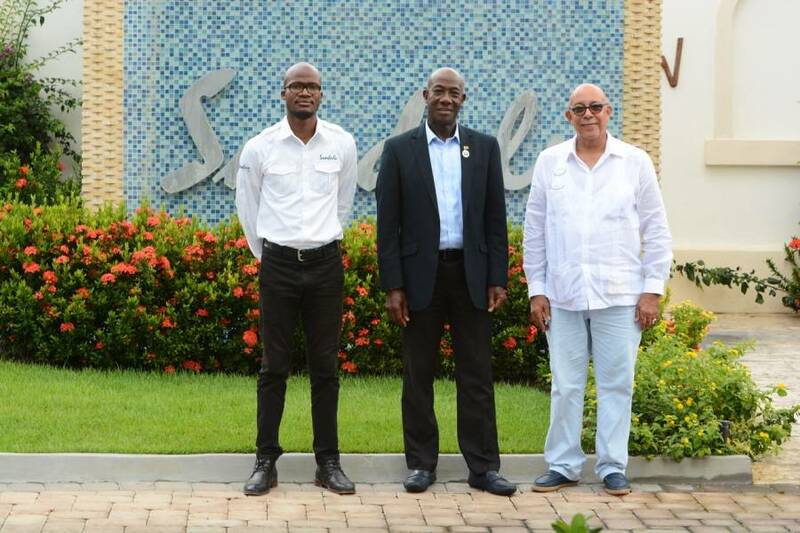 Trinidad and Tobago Prime Minister Dr Keith Rowley had his first Sandals Resorts experience in Grenada on Thursday. The Prime Minister paid a courtesy call on General Manager for Sandals LaSource Grenada, Peter Fraser, following the CARICOM Heads of Government meeting that took place on the island. Discussions with the Resorts General Manager ranged from Sandals’ social and economic impact to the island of Grenada, staff training and welfare, and support for the local agriculture and poultry sector. It is no secret that the presence of Sandals Resorts in Grenada has vastly amplified the island’s presence as a tourism destination and has also realised tremendous growth in airlift and visitor arrivals to the territory. Fraser confirmed a robust relationship with local suppliers and underlined ongoing discussions to further increase local production of fruits and vegetables to supply to the resort and reduce import volumes. The Trinidad and Tobago Prime Minister reaffirmed his country’s commitment to having the globally recognised Sandals brand in Tobago and confirmed that discussions are still underway to make this a reality. Sandals and Trinidad and Tobago began talks of a brand expansion in Tobago about 11 months ago.